Nespresso has been the king of single-serve espresso makers for a while now. But even though it’s been churning out premium looking and brilliant functioning machines, there’s one thing that has been missing: the ability to brew a regular ol’ cup of coffee. And this is the niche the Nespresso Vertuoline Coffee & Espresso Maker tries to fill. At a going price of Check on Amazon - this Nespresso comes with the Aeroccino Plus milk frother and the ability to brew either a cuppa joe or pull a shot of espresso at the press of a single button. Oh boy this machine looks just as elegant as its name. It sports a throwback-look, reminiscent of an old school diner, complemented by a sleek exterior that gives off an undisputable premium feel. You can opt for either chrome, red, or black. But we won’t lie; the black model looks butterflies-in your-tummy worthy. The sturdy build measures out at 11.9 x 8.3 x 11.9 inches, and is coupled by a respectable weight of 12.3 pounds. Minimalism seems to have been the motivation when designing the VertuoLine, with only one button to be found on the entire machine. This coffee maker is equipped with a 40 ounce water tank that is effortless to remove, a pretty powerful Nespresso 19 bar pump, and a pods bin that easily holds about 13 used capsules. It also sports three adjustable cup heights, comfortably accommodating dainty cups to massive mugs. Well, it doesn’t get easier than this. Unlike other espresso machines that require you to do some grinding, tamping, and praying that you know what you’re doing, this one makes everything a walk in the park. 1-Touch Brewing: The ease of brewing is almost unbelievable. 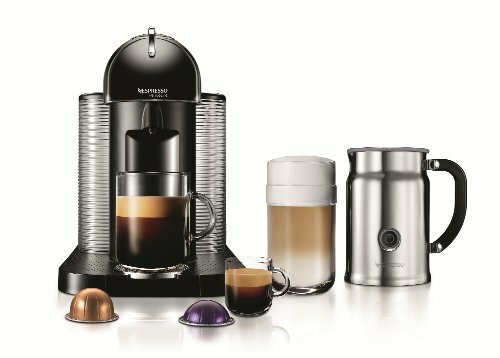 All you have to do is open the pod compartment at the top, fit in one of the compatible Nespresso Vertuoline capsules, press the lid back down, hit the 'start’ button, and you’re good to go! What king of voodoo is this, you ask? No magic here, just some pretty smart tech. See, every capsule is stamped with a unique barcode. Once you slip it in, the machine determines what kinds of settings are ideal to produce the most flavorful cup of coffee. 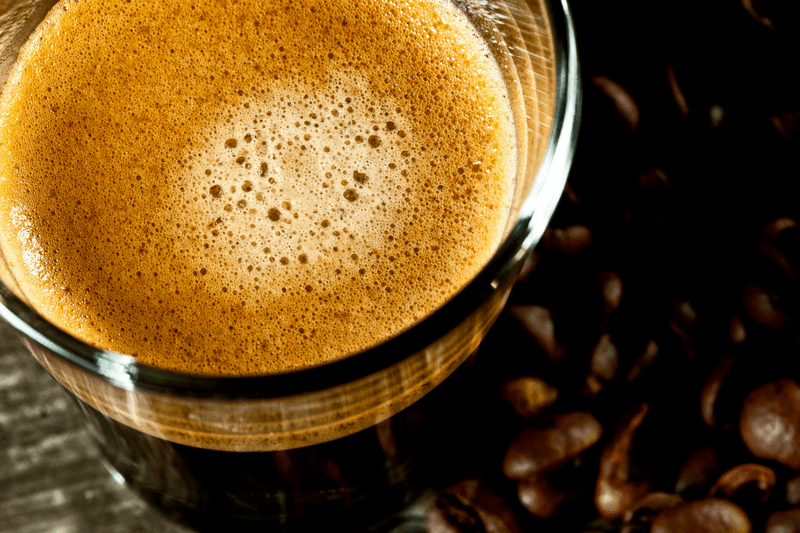 By default, the brew quantity of a regular cup of java is set to 8 ounce and that of espresso to 1.35 ounce. However, it’s possible to tweak this capacity between 0.3-17 ounce. Next time you want some coffee, the unit will remember your previous settings. Aeroccino Milk Frother: If you decide to go with the Nespresso VertuoLine bundle that comes with the frother - and you should - then you'll delight in how easy this is to use too. It sports a single button that allows you to froth hot or cold milk and is a pretty sight to behold too! One of the hallmarks of a good single-serve coffee maker is speed. And with a brew time of 2 minutes the Nespresso VertuoLine might seem fast, but in reality it lags behind the pack. It takes nearly twice as long as the Keurig and Verismo, probably because of the time taken to scan the barcodes. While the whole technology behind the barcodes does make life much easier, it also makes it a bit limited. You simply can’t go ahead and use capsules from any other Nespresso. The pods, especially the ones for coffee, are also much larger than the norm, which can make storage a bit of an issue. The Aeroccino frother scores top marks for both aesthetics and functionality. If you’re a latte and cappuccino fan, you’ll undoubtedly fall in love with the rich, thick foam this bad boy produces. Now all they need is to find a way to incorporate it directly into the coffee maker and they’ll have a true winner on their hands. PRO TIPS: It’s always wise to check on the water level in the tank before you start brewing. The Vertuoline capsules are pricier compared to other Nespresso machines, with a pack of 30 going for $33.00. The last thing you’d want is wasting one of them due to running out of water. You’ll never have to worry about emptying out drippy filters and cursing way too early in the morning with this Nespresso coffee maker. Once the brewing cycle is complete, simply lift the lid and the used pod is directed into the capsule bin. Regular maintenance of the unit requires a bit of a learning curve, but it quickly becomes second nature once you get a hang of it. To initiate the cleaning cycle, press the control button thrice in two seconds; to descale, depress it for seven seconds and the machine will automatically do its thing. It has to be said, the VertuoLine’s crema is nothing if not excellent. It has the body and hue worthy of a billboard. Nespresso welcomes you into the family with a set of 12 capsules that should give you a taste of its Grand Cruz line of coffee and espresso. 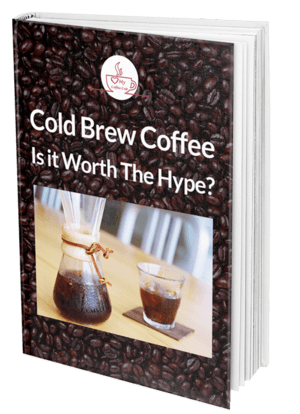 There’s just one caveat; if you like your joe piping hot, you just might be disappointed with the coffee’s temperature. It’s dispensed at about 140F, while other machines manage to achieve temperatures of 160F. Warming your cup beforehand could make a bit of a difference but takes away from the promise of convenience a brewer like this is hinged on. Beautiful design with durability to match. Not compatible with other Nespresso capsules. 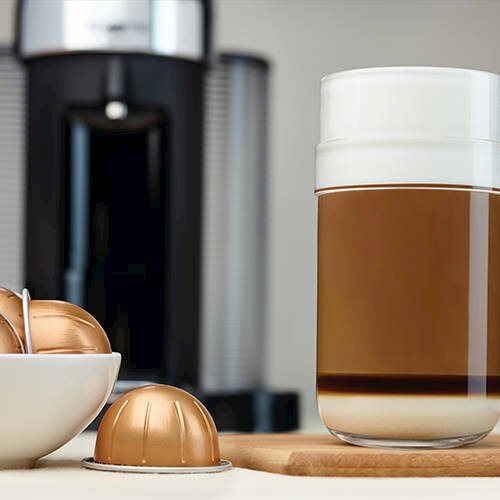 Nespresso’s quest to create a single-serve coffee maker with dual capability has resulted in a pretty impressive machine - you get the freedom to whip up coffee, espresso or cappuccino at the touch of a button. 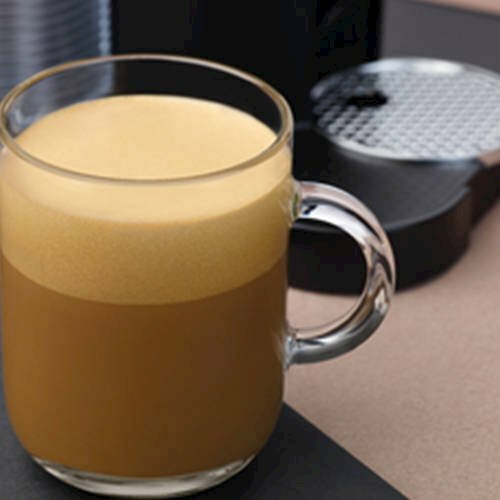 ***Have you tried the Nespresso VertuoLine Coffee Maker, let us know in the comments below!